Icarus Films: What's for Dinner? Meat is now central to billions of people's daily meals. The environmental, climate, public health, ethical, and human impacts are enormous and remain largely undocumented. WHAT'S FOR DINNER? 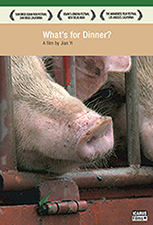 explores this terrain in fast-globalizing China through the eyes of a retired pig farmer in rural Jiangxi province; a vegan restaurateur in Beijing; a bullish young livestock entrepreneur; and residents of the province known as the 'world's factory' contending with water polluted by wastes from pig factory farms. They personalize the vast trends around them, in a country on the cusp of becoming a world power. Given that every fifth person in the world is Chinese, what the Chinese eat and how China produces its food, affects not only China, but the world, too. Dr. Tian Yongsheng is a government official and vegetarian who worries about the ecological impacts of feeding a growing livestock population. Wang Ronghua is a young pig and poultry livestock entrepreneur is building a new pig facility in his hometown. Wen Bo, one of China's leading environmentalists, works for National Geographic's Global Exploration Fund for China. Wu Xiaohong is an animal welfare activist in Beijing. Xiao Muxiu is a pig farmer whose small-scale business is threatened by the fluctuating price of pork. Xie Hongying owns Donald Macky restaurant, a home-grown Chinese fast food outlet in Ji'an City. Xie Zheng is a pop star, activist, and founder of the vegetarian advocacy group Don't Eat Friends. Yu Li is the owner of Vegan Hut in Beijing. Yi Shengming is a pig farmer in Yi village in Jianxi province. Zhou Shuzhen is a retired pig farmer in Jiangxi province.